How do you demonstrate social media ROI to your key stakeholders? In 2015, over $24 billion will be spent on social media advertising. Now, more than ever, brands are creating digital content and campaigns for their online communities. With this large investment, the social landscape has become noisy and brands and publishers are fighting for virality. Social content and the role of the Social Media Manager has transformed tremendously in the last five years. Engagement used to be king. Success was measured through amount of likes and shares. This is no longer the case. Your social strategy needs to extend from just building brand loyalty and awareness to customer acquisition and retention. It’s imperative to create a strategy that proves the power of social media as a revenue channel. To successfully transform your social media community from a cost center to a profit center, you need to understand which content is most effective. Fortunately, the large array of analytics available can give highly actionable insights and results, so you can create a data-driven social strategy to justify your seat at the table. 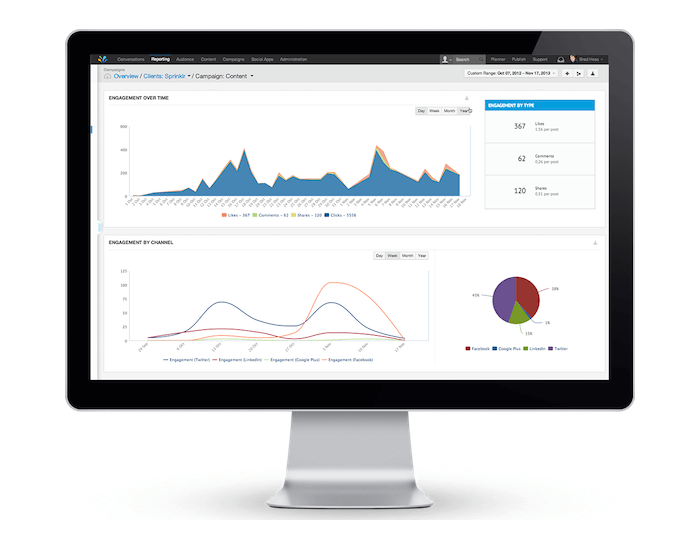 Take advantage of the built-in analytics published by the platforms themselves. Tracks prospects and shows you which tweets, shares and updates actually generate paying customers and sales. Use these insights to optimize your content calendar with appropriate brand messaging and creatives. The more targeted your posts, the higher the engagement and conversion rates will be. Now that you have your content calendar down, make sure you are posting to the correct social channels. Each day there is a new social media platform launching: Periscope, Meerkat, Ello launched within the last several months and already changed how brands can communicate with their customers. Make sure you are using your time and resources correctly and focus on channels where your customers are. For example, if you have a predominantly male audience, it doesn’t make sense to invest heavily on Pinterest – which has a 68% female audience. Clearly define your KPIs and if they fit for each platform. For direct-response campaigns, Facebook and Twitter are well suited for signups or e-commerce conversions. If Facebook or Twitter have proven to be strong content channels, consider pushing ad budgets using the targeting tools provided. News Feed style ads that don’t publish to your timeline or in your fans’ newsfeeds. These are helpful for spreading the word without spamming your fans. You can target promoted tweets at potential customers who follow or favorite similar companies to yours. You can even target your competitors’ followers with custom tweets. Website Cards allow you to showcase website content within a Tweet, giving users the ability to preview an image, related context and a clear call to action all from their home timeline. Keep abreast on industry trends and changes. 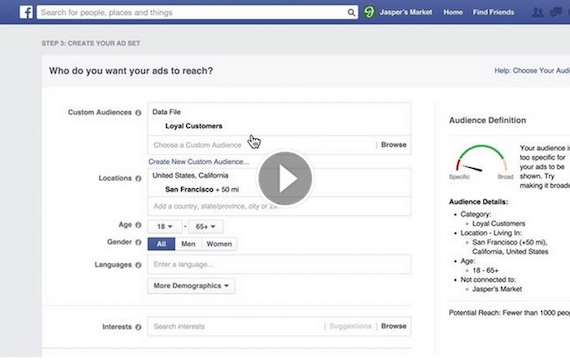 Facebook announced at F8 that video ads were going to be key for brands. Create content that your audience will see, especially as Facebook’s organic algorithm is constantly evolving. For brand awareness, platforms like Instagram and Snapchat are key, since their native content is naturally product-centric. Both platforms are toying with advertising, but right now, brands should use these platforms to tell their stories through engaging photos and video content. Use them to build out a strong organic following and track your follower growth by monitoring likes, comments, regrams, hashtag use, and number of viewers of Snapchat stories. Your community is your key to success. Followers spread the word about the benefits of your products and offerings. Reward them, and in doing so, you will build out your brand and see an increase in conversions. Social media contests are a great way to do this. Each channel has different rules and ways to hold a contest, but all can produce the same result — more followers, sale conversions, and user-generated content. Use the UGC from your contests in your own marketing materials. Take testimonials from your comment-to-win contests and create blog posts from those comments. And create a landing page of all the contest photos and videos to spread your brand personality. The best part of this kind of two-way communication is that you’re able to generate a bunch of content from your own community members. Purchase-to-Play contests has fans snap a picture with your product so that their Instagram followers take notice. The winner may be the most creative, the funniest, or the best presented post. This kind of contest provides an incentive for your followers to purchase your products, which can be boosted by influencers, so it’s an easy way to drive ROI. 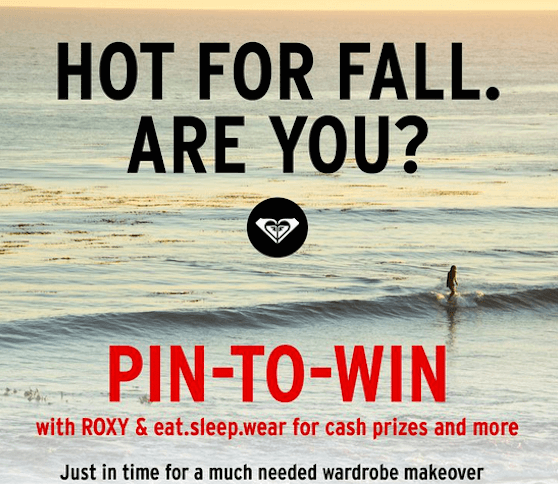 There’s a low threshold for participation in Pin to Win contests. The contests produces a multitude of repins from your brand and are great advertisements for your products. 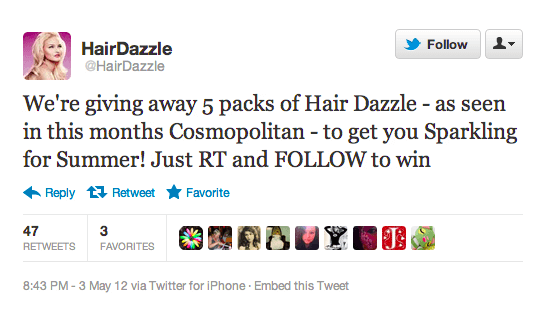 Retweet contests are a win-win for brands and followers. With only a click of a button, brands are able to spread their messaging and calls-to-actions. Additionally, it is a ripple effect, as the follower’s followers will see the tweet and engage in the contest. You can incentivize your community to spread the word to their family and friends via referrals in order to participate in events, contests or promotions (give $20, get $20). By doing this, you can engage your audience in a fun way while tracking customer behavior and measuring the virality of different types of events. When your consumers share their referral links, you can have them send pre-written copy that they can share across all social media channels. Furthermore, everyone loves a sale, and promo codes are the marketer’s dream, because they allow for conversions and further behavioral insights. You can reward your loyal social media fans with a discount code and see your reach spread quickly. Create a different code for each social channel and see how many sales each campaign generates. According to a McKinsey Study, marketing-inspired word-of-mouth via “peers” generates more than twice the sales of paid advertising, with a 37% higher retention rate. On Instagram and YouTube alone, there are over 150,000 social media influencers who have anywhere from thousands to millions of fans and are trusted for their opinions on anything from fashion, beauty, lifestyle, fitness, food and other product choices. You can harness the power of influencers to create high-quality content and spread the word about your brand, review your products and run giveaways. Influencer content is also among the highest converting content there is today, because their content is naturally talking about what to buy. It’s not uncommon to see CPC ranges in the $1-2 or even less than $1, particularly when the influencer is a good fit with the brand. That’s why it’s important to find influencers that match your brand in terms of content, style and audience, as well as making sure that they actually like the product they’re promoting. You might have heard of larger influencers like Josh Ostrovsky and Jen Selter working with big brands like Lululemon and Nike. They’ve been featured on major media channels and even started their own ventures. But you don’t need to have a big budget to work with influencers. There are all kind of influencers across each vertical that don’t demand $15,000 per campaign. In fact, you can find influencers at all price ranges, including those who might post in exchange for commissions, cross-promotion or even just getting to try cool products from your store. As long as you have a brand that is exciting, you can find people to promote it. 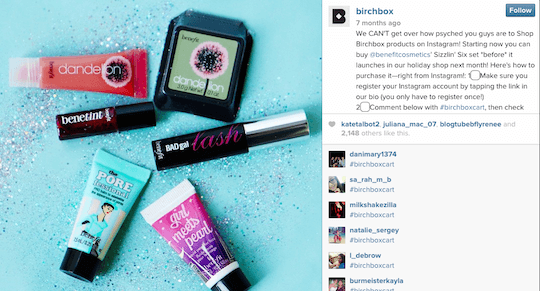 Numerous e-commerce brands have scaled their business with influencer marketing. In four years, Bellami Hair became a multi-million dollar business by producing videos with hundreds of popular YouTube beauty gurus. Not only has this been tremendous for their brand, but their average video sees an ROI of several hundred percent on sales. They’ve gotten so good at co-branding with influencers that they now do celebrity endorsements with Kylie Jenner. L*Space by Monica Wise and Triangl Swimwear are two great examples of how fashion brands became Instagram sensations, powering their growth. L*Space became a phenomenon by gifting products to fashion bloggers and lifestyle Instagrammers and cross-promoting on over 100 Instagram posts that reach 20+ million people every month. Does their content align with yours? How is their engagement rate? What is their subscriber growth? Not every video will be a colossal success. The key is generating a variety of content, tracking which posts/creators are successful, and re-investing behind them. Once your organic following has healthy growth, focus on monetization. Your followers are already engaged with your content. It is now easy to convert them into customers. 30-50% of your posts should be product related with strong purchasing calls-to-action. Use third party social media selling tools like Soldsie and Curalate in alignment with your content strategy. Soldsie allows your followers to purchase directly from Facebook and Instagram. Your followers just comment #Sold or with a branded hashtag and then are sent an email to checkout. This way they can shop from anywhere — as most of your consumers are already checking their social media feeds. 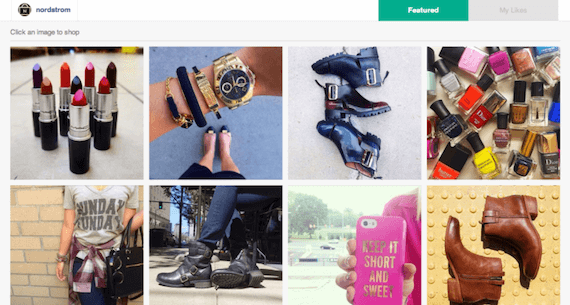 Another social selling tool is Curalate, which makes your entire Instagram feed clickable, and ultimately shoppable. All of your product photos can now link to your e-commerce website for checkout. Not only can you use this for product photos, but for blog content that you want to see higher readership. Just put the link in bio and then track sales and clickthrough rates from your Instagram photos. 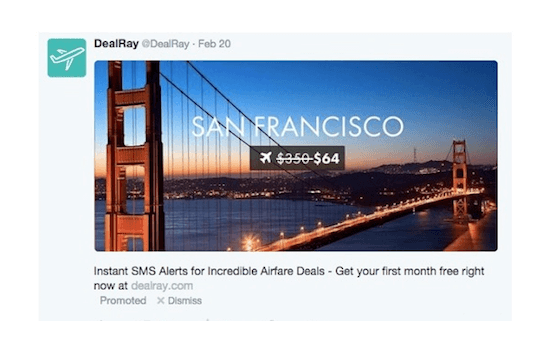 You can now directly attribute product purchases from social media. This is important, because there is 75% web shopping cart abandonment, and now social media can be a driver in generating revenue right from the platform. By using social selling tools, you can easily target your customers where they are already spending their free time. Social selling not only produces conversion rates, but also positions your brand as innovative within the social media landscape. You can find additional value adds from working with these tools including collecting emails that can be used for your database and increased follower reach — as your customers are putting in their email addresses when they register for these tools. From all of this direct social sales, it is important to measure the average value of your followers on different social networks. Track sales on your social posts to understand how many followers are converting, which allows you to understand how much you can spend to acquire new followers. From there you can create allocate budget to growth marketing, influencer marketing, and direct advertising. YouTube has been a phenomenal channel for brands to invest marketing dollars into over the last few years. In addition to being able to work with thousands of YouTube influencers to promote your brand, it is also the world’s second largest search engine, which means you can drive considerable SEO by producing solid videos, or having influencers make them for you. It’s also easy to measure and track success thanks to the number of CTA options, from annotations directly in the video to tracking links in the description. YouTube also recently unveiled shoppable ads, which will allow you to sell products directly via YouTube videos created on your own channel or influencers’ channels. As Instagram has become the new magazine, influencer marketing the new word of mouth, and YouTube the new television, social media strategies must reflect the ongoing changes to the digital landscape. Never before have marketers been able to pull out as many customer insights, testimonials, and follower data. Social media has changed how brands communicate with their audience, and now it is time to turn those conversations into conversions. By incorporating these tools and techniques, you can demonstrate a strong social media ROI to the important stakeholders. About the Author: Kate Talbot is the Content Marketing Manager for Revfluence, one of the largest influencer platforms for e-commerce companies and consumer brands, with clients like Calvin Klein, Madewell, Walgreens and Rent the Runway. Kate has over eight years of experience creating and executing content strategies for early-stage startups and global brands including Virgin America and Kiva. Connect with her on Twitter and LinkedIn.